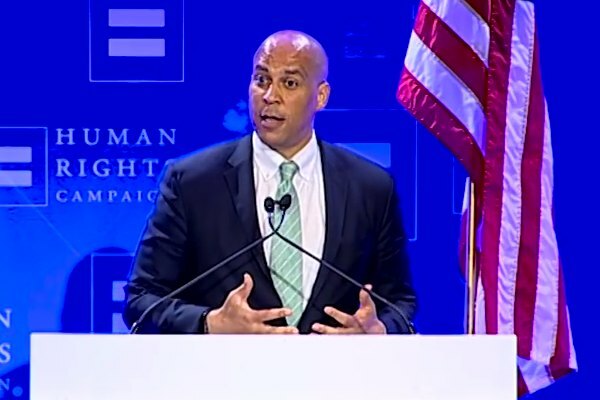 New Jersey Senator Cory Booker, who is vying for the Democratic presidential nomination, said Sunday that he'd reverse President Donald Trump's ban on transgender troops “right away,” if elected president. Booker made the pledge while speaking to more than 300 voters, the AP reported. Trump first tweeted his decision to ban transgender troops from serving in 2017. Four lawsuits followed challenging implementation of the ban. Last week, the administration said its ban would take effect on April 12, the result of a Supreme Court decision allowing implementation while the policy is being challenged in the courts. The Palm Center, a think tank at the University of California, Santa Barbara that promotes the study of LGBT people serving in the armed forces, called on other presidential candidates to commit to ending the ban.